At the Arbor Lakes Business Association (ALBA), Community is Key. We see to it that our community thrives in a positive and bountiful environment: Our Arbor Lakes shopping districts. We do this by equipping and empowering our businesses and organizations with an ever-growing well of resources that we've specially built up, curated, and launched time and time again, with results that keep the community engaged and buzzing. Through implementing special events, promotional and charitable events, centralized and shared advertising and marketing opportunities, and civic activities that benefit Arbor Lakes businesses, our members enjoy higher visibility, improved sales, loyal customers and clientele, and a positive local reputation. 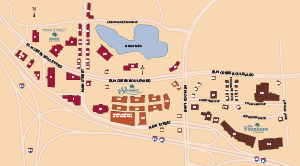 The ALBA Membership Network spans all across the Arbor Lakes Districts, including Main Street, The Fountains at Arbor Lakes, The Shoppes at Arbor Lakes, The Arbor Lakes Medical Building, Great River Energy and area hotels. Contact us using the form below, and find out more information about becoming a member of the Arbor Lakes Business Association.